Performed by a competent person before each use, often in the morning as part of opening procedures and/or while lying out equipment for yourself or your guest. Triggered by a big weather event, product recall, accident, trend of near misses, etc. Inspect from one end to the other, top to bottom, etc. 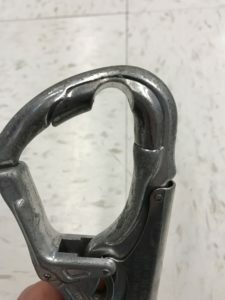 For example: Does the carabiner gate close fully and easily? 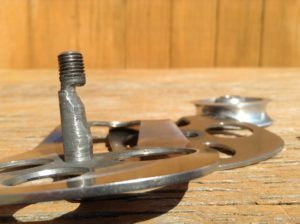 Does the pulley sheave roll smoothly? Does the buckle close fully and securely? Is the PPE compatable with the other pieces of PPE in the overall system? Inspector’s Motto: Always Assume Something is Wrong. Working off this assumption rather than a mentatlity of “I’m sure its fine” will help you find defects and fend off compaciency. Further information on the inspection of specific PPE should be referenced in the original equipment manufacturers (OEM) specifications for that item. One should always defer to the manufacturer’s guidelines. The general guidelines for inspection criteria of PPE outlined here is in no way meant to replace the manufacturer specifications. The OEM specifications can be found enclosed in the original packaging and/or on the manufacturer’s website. Much of this document is based on specific criteria from Petzl as they boast the most comprehensive body of helpful information on this topic. Has significant scoring or deep grooves (check with OEM for material loss tolerances) a tolerance of no more than 0.1mm is often given. 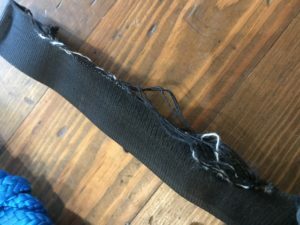 Leather gloves and glove pads used to protect the hands from friction/abrasion on rope and zip cables should be evaluated for integrity and should not have holes in them. They are part of your safety system and should be treated as such. Full finger length, close fitting gloves that allow you enough dexterity to operate carabiners but still protect your entire hand are best. Poor fitting gloves are cumbersome to use and ¾ length gloves could potentially ncrease the risk of rope burn on finger tips which may cause you to lose control of the rope/cable you are managing. When an item of PPE is found to have a defect it should be quarantined and not put back into use. A quarantine bin should be available for staff to deposit but not withdraw suspect items of PPE. An effective strategy is to have a bin with an opening large enough to easily deposit items but difficult to remove them. Consider a labeling system that may include: Name, Date, suspected defect. Items suspected of chemical exposure should not be placed in general quanantine bin potentially exposing other gear to contaminates. Periodically, a qualified person can audit the quarantine bin to decide which items of PPE should be retired, which need maintenance, and which can be put back into service. The tagging system allows the qualified person to be able to have specific conversation with the person who quarantined the item. Note: An exceptional event can lead to the retirement of a product after only one use, depending on the type and intensity of usage and the environment of use (harsh environments, sharp edges, extreme temperatures, chemical products, etc). If there is ever any doubt about the integrity of a piece of PPE, it must be removed from circulation and quarantined. 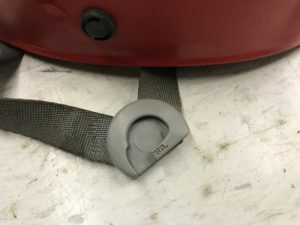 Additionally, gear should be retired if it has been subjected to a major fall (or load), its full usage history or in-service date is unknown, or it becomes obsolete due to changes in legislation, standards, technique, or incompatibility with other equipment, etc. © 2017 Challenge Towers. All Rights Reserved.